If you've been alive on planet Earth and in the art world during the last year (which we have to assume you have been, since you're reading this at all), you've probably heard of the documentary 'Jodorowksy's Dune'. 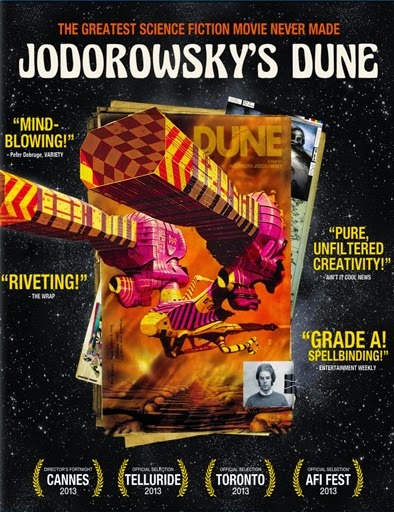 An excellent film about Jodorowsky's stunning yet failed attempt to create a movie version of the fantastically popular science fiction novel Dune by Frank Herbert, the film was shown at festivals around the world to great acclaim. Though perhaps more a cult classic in the popular world's imagination, the film is nothing less than a testament to what has been dubbed 'The Greatest Science Fiction Movie Never Made' - Jodorowsky's Dune. Jodorowsky is a decidedly eccentric and charming fellow, very intense and passionate about his vision. Famous to another generation for several surrealist films, El Topo and The Holy Mountain, Jodorowosky's version of Dune was to be his greatest masterpiece. Even from a modern standpoint, it sounds absolutely incredible, although his vision of the film took some major liberties from the original source material of the novel. Working in collaboration with H.R Giger and Salvador Dali among many others, including the top special effects creators of the time, the film became much larger than any production budget could handle, despite being one of the most appealing films that has been seen in Hollywood in the last 30 years. Alas, it was never made, but lives on - at least in part - in many of the science fiction movies that we know and love. It's lamentable to think that something so wondrous, bizarre and beautiful was shut down, but it had spiraled wildly out of the scope of a single movie at the time, and Hollywood had not yet hit on the idea of creating a series of films at the time, though it would soon explore Star Wars and all that offered. Contrasted with the 1984 version of Dune that was eventually created by David Lynch, it would have been stunning, no matter the length. Jodorowsky is still alive and working at 85, and recently released another film, The Dance of Reality, which is a surrealist reimagining of his boyhood in Chile. "I want to liberate my imagination and my mind with every kind of movie. That is what I wanted to do all my life." Hard to argue with that!